Millions of dollars later, Maryland has officially decided that its 15-year effort to store and catalog the "fingerprints" of thousands of handguns was a failure. Since 2000, the state required that gun manufacturers fire every handgun to be sold here and send the spent bullet casing to authorities. The idea was to build a database of "ballistic fingerprints" to help solve future crimes. But the system -- plagued by technological problems -- never solved a single case. 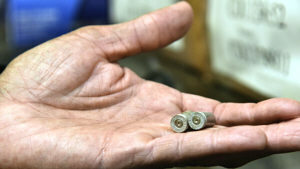 Now the hundreds of thousands of accumulated casings could be sold for scrap. Another anti-gun idea that failed miserably, at huge tax payer expense .... as if it was ever going to succeed anyways. "The database "was a waste," said Frank Sloane, owner of Pasadena Gun & Pawn in Anne Arundel County."